A few months ago I came across an article in a magazine about fashion related graphic novels and immediately started looking for them. It took awhile for my library to get the first one for me, but this past week it finally arrived! Nell Brinkley was an artist for Hearst Magazines. 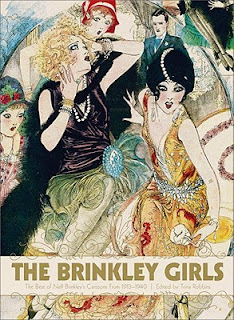 Her specialty was beautiful girls, and her drawings so distinct that the girls she created were known by her name, The Brinkley Girls. Trina Robbins collected Brinkley’s full paged art, found in American magazines during the early part of the 20th century, into this volume. Robbins adds a bit of background and commentary but mostly lets Brinkley’s art speak for itself. Brinkley’s work is broken into three styles: the serials, the Flappers, and the pulp series. The serials are the earliest (1918-1922) and most garish. The panels are a single illustration with text written by Brinkley. I’m not sure if it was the style at the time or what but I couldn’t read her stories. Brinkley seemed to believe why use one adjective when you could use three. The drawings are beautiful but dramatic with ladies’ hair, dresses, and scarves blowing into the wind. Drama was the order of the day. The Flappers were my favorite. Brinkley changed from a single illustration to five on one page. Text was written by Carolyn Wells in bad verse. The girls are awfully dumb but they had great fashion sense! Prudence Prim is harassed by lechers every time she steps outdoors but can’t decide if she wants to have adventures or run back home. Flossie is obsessed with psychics and her boyfriend is a jerk, Dimples is a dreamer with a jerk for a boyfriend too, and Gloriette a French girl in America trying to navigate the cultural divide. The 1930s make up the final chapter. Brinkley illustrated and wrote these pulpish looking series: Heroines of Today and The Princess from Nowhere. Heroines of Today is interesting since the stories are based on real women. The girls have that American girl next door look to them, much different from the cartoonish Flappers. The Brinkley Girls is beautiful to look at and well laid out. It is a large coffee table style volume. I imagine that the art here is much larger than it would have appeared in the original magazines. All the better to see it, my dear! I am passionate about the 20's, from the styles to the perfume to the writers. His looks like a marvelous book! This sounds fabulous! I must search it out. How wonderful! Sounded even better when you said coffee table sized, must be really nice just to flick through sometimes. Yes, I love the size. I was surprised by that but it's nice.